Many times over the last few years, I’ve wanted to stop writing about chronic traumatic encephalopathy, or CTE. I always think I am going to run out of ways to discuss it, even though it is arguably the biggest story in football over the last decade. I do read the latest research, because I know explaining it to concerned athletes and parents can be helpful to them. When I read two studies offering the latest news about CTE that came out over the last few days, I knew I needed to share my perspective on them. I discussed this news about CTE in my latest newspaper column. Last week brought both good and bad news for football and the degenerative brain condition chronic traumatic encephalopathy (CTE). On one hand, a study showed just how big of a problem CTE is for the sport. Another study offers a glimpse of the future for predicting athletes at risk and developing treatments to reverse the disease. Let’s start with the bad news. On Friday, the Concussion Legacy Foundation released an analysis about the scope of CTE in college football. Based on data from a study earlier this year out of Boston University, researchers found that 147 college football programs had at least one former player diagnosed with CTE. Looking at the list of schools, it’s hard to think of one that doesn’t appear. Every school in the Power 5 conferences (ACC, SEC, Big Ten, Big 12 and Pac-12) had a player diagnosed with CTE. 26 schools had at least three cases of CTE, and those programs make up a “who’s who” of elite programs. Georgia led the nation with nine cases. This data is shocking just for the sheer breadth of the CTE issue. But it also makes abundantly clear that CTE isn’t just an NFL problem. Sure, a large number of the players probably did make an NFL roster, and some might have had decent careers in the league. Only a fraction of college players make the pros, though, but they could be left with damaged brains. 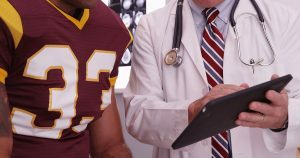 Maybe this study will raise the question about coverage for future health problems of college athletes. New research last week, though, does offer hope, albeit a long time in the future. Experts have long wondered why some former athletes develop CTE while many do not. Of all the theories offered, most point to a possible genetic link that could play a role. On Saturday, researchers at Boston University published a study that links a particular gene to CTE. Specifically, the gene appears to be implicated among former players who developed the most severe forms of the condition. The gene is known in the scientific world is TMEM106B. It is believed to play a role in the breakdown and elimination of proteins in our cells. It’s involved in the inflammatory response of the brain to injury and infection. It has been linked to other degenerative brain conditions, including a form of dementia. Among athletes diagnosed with CTE, those with one copy of the gene were 2.5 times more likely to develop dementia. Athletes with two copies were five times more likely to develop dementia. While these athletes with the gene appear to be more likely to develop severe cases of CTE if they do get it, it doesn’t appear that the gene plays a role in developing the condition in the first place. That fact, and the fact that 60 percent of the population has the gene, makes it impossible to use as a screening test for athletes at risk for CTE. This gene offers the first step into figuring out why some athletes get CTE and others don’t. Clearly a history of repetitive subconcussive blows serves as the baseline. Blows to the brain over a long period of time, whether from football, another sport or blasts in military service, increase your risk. There clearly are other factors, such as environmental and genetic links, although it seems likely that many play a role. One day, though, we might be able to screen an athlete for a series of genes that could suggest that he or she shouldn’t play contact or collision sports. This study and others that will follow might also start to give clues as to the mechanisms by which CTE progresses and destroys the brain. This information could open the door to treatment strategies for affected athletes. In the next few years, I expect research to come faster and faster. Let’s hope it brings answers fast enough for the athletes playing football right now. Note: A modified version of this article appears as my sports medicine column in the November 8, 2018 issue of The Post and Courier. Analysis shows 147 college football programs had at least one player diagnosed with CTE. By A.J. Perez. USA TODAY. November 2, 2018. BU researchers make first link from severe CTE to genes. By Felice J. Freyer. Boston Globe. November 04, 2018.